I have to admit I’ve always been a bit of a shoeaholic in fact if you ask my friends they still question if I wear my stilettos out to milk the goat! So I laughed today, literally out loud in the barnyard carrying the slop bucket out to the pigs. I grew up “ in – town” a small town but still town, I was not a farm girl nor did we growing up ever have animals that were not “pets.” A petting zoo when I was young was as close as I ever got to “farm life.” Don’t get me wrong I have always loved the outdoors, and we spent much of my child hood exploring the great outdoors getting dirty and adventuring many remote locations outside my small hometown. However, this did not change my desire to after graduation move to a bigger city where I could nightly don my party dresses and stilettos. Then I met Steve and to my amazement he brought out the get down and dirty adventurous side of me that I reserved for only some occasions. I still make the 60-mile commute daily for work and often fly to a neighboring city for meetings at which I am always business appropriately dressed but at the end of the day my favorite thing is arriving home zipping up my jeans and heading out to the barn yard with Steve to see the animals, or embarking on our next big adventure! This is where the laughter came from and likely why the animals looked at me as though I had lost the plot. As I headed out to do chores this morning before getting ready for work I was making a mental to do list for the things I wanted to accomplish today. (Personally! – My work list sits nestled on my desk and I try hard not to let that infiltrate my brain when I’m not in the office!) As I was running down the upcoming event list and what I would need to prepare for the next few days, I remembered that I needed to take my ball gown to the seamstress to have the broken zipper fixed, and that I would need to drop off Steve’s Tux at the Dry cleaners and I would need to remember to get those garments out of the closet before leaving for work! This though made me laugh out loud! My ball gown why on earth do I, the now country girl in her rubber boots carrying pig slop, need a ball gown. 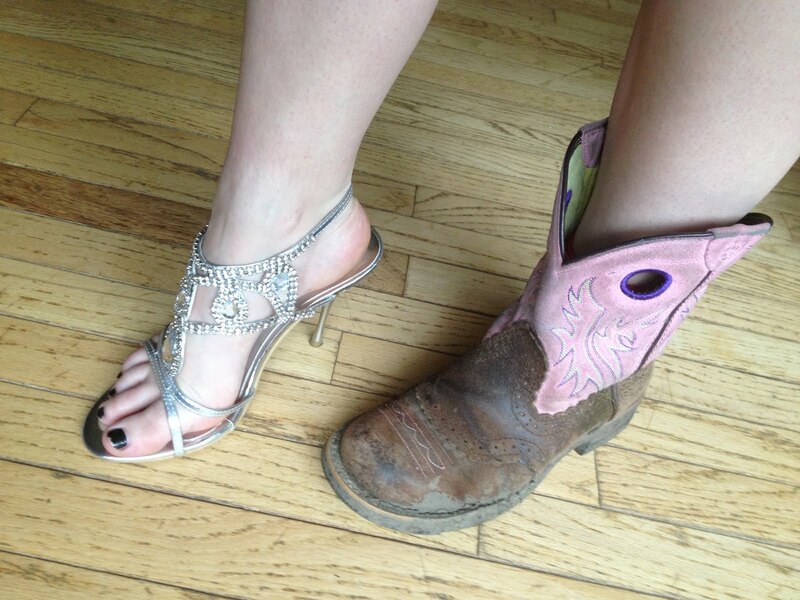 Steve and I were invited to a fundraising gala (black tie formal – the invitation read) so as the weekend nears I will set aside my cowboy boots and slide in to my high heals, pretty up my hair, and slip in to my gown. It really was an honor to be invited to such an event and I am sure we will have a wonderful time. I still always enjoy the moments when I get to dress up for a night out on the town. And I still love my shoes… some things will never change!